Loyal HeroesCon veterans know that our annual QuickDraw Contest is a great way to put your creative and artistic talents to the test! A HeroesCon tradition, the QuickDraw is our all-ages artist competition where we give you #2 pencils and Bristol board, and you give us 20 minutes of your feverish inspiration. A qualified Art Instructor then judges the results and we, in turn, give the winners some fabulous prizes. It’s a win-win and it’s open to any and all who want to try their hand at creating some HeroesCon original art! Stepping in to sweeten the prize-winners’ pot this year, the following companies have donated more than $10,000 worth of prizes to give away to the talented winners!! Prizes are awarded for 1st, 2nd, and 3rd place, in three age categories: 10 & under, 11-15, and 16 & up. The QuickDraw is held on all three days of the show, so you have three opportunities to take home some incredible art supplies and bragging rights! Prizes from these companies will also be awarded to participants of our Drink and Draw on Friday night, June 6 at the Hilton! Drink and Draw submissions will be judged by a panel of some of our favorite Artist Alley Pros, and prizes will be awarded at our show on Saturday! We would also like to thank Artograph, Jerry’s Artarama, and Prismacolor for helping to supply our 2013 Live Art Stage, where artists will be crafting their pieces for the HeroesCon Annual Art Auction. The Art Auction will be held on Saturday June 7, from 8PM – until in the Providence Ballroom at the Westin Charlotte. We hope to see you all there!! 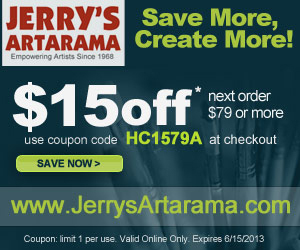 As an added bonus, Jerry’s Artarama has provided us with this coupon that you can use from NOW until June 15 to get $15.00 OFF your order of $79.00 or more! So get yourself some art supplies, and maybe one day we’ll be seeing YOU in our famous Artist Alley! ← HEROESCON 2013 GUEST LIST UPDATE :: IVAN BRANDON! & MORE!